An environmental group is working with Burma’s government to create a Kachin State national park to protect the forests of the endangered Myanmar Snub-nosed Monkey. RANGOON — An international environmental organization said it is working with the Burmese government to create a national park in Kachin State’s Hsalaw Township in order to protect the forests of the critically endangered Myanmar Snub-nosed Monkey, which are being logged by traders supplying timber to nearby China. 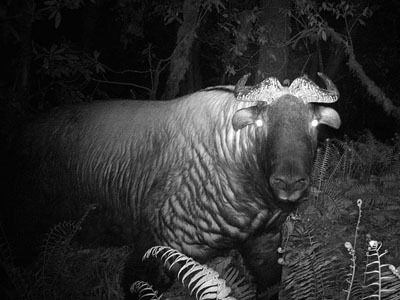 Flora and Fauna International (FFI) discovered the species in 2010 after installing camera traps in the region, which is part of the eastern Himalayas. Recently, a FFI team comprising members of the local Law Waw tribe made the first ever sighting and video recording of the elusive primates, which are believed to number only between 260 to 330 individuals, the group said in a statement Monday. The Myanmar Snub-nosed Monkey has a long tail and black fur with white ear tufts and beard. It lives at higher altitudes in mixed temperate forests in the summer and descends to lower reaches near villages when snow falls in winter. Momberg told The Irrawaddy that FFI has held discussions with local, state and national level authorities about creating an approximately 230,000-hectare national park to protect the mountain habitat of the Snub-nosed Monkey from illegal loggers, which are decimating Kachin State’s forests in order to supply a vociferous Chinese demand for high-grade timber. “A joint team of biologists from the Forest Department and FFI have just returned from Imaw Bum to complete the biological justification for the notification of a new national park,” he said, adding that the planned park would border on a Unesco World Heritage Site in China’s Yunnan Province, where the primates have also been spotted. The area’s proximity to China is proving a huge challenge to the monkey’s survival as—like in other parts of Kachin—old growth forests are being logged in Imaw Bum and sent across the border to China through a massive, unregulated trade in timber extracted from ethnic conflict areas beyond government control. “The National Park notification will at least provide a strong legal basis to outlaw Chinese illegal logging in the area and put further pressure on the Chinese government to curb illegal logging on Myanmar territory,” Momberg said. He said the planned park area was under control of National Democratic Army of Kachin—a pro-government militia—and added that it was not directly impacted by the ongoing Kachin Independence Army insurgency, although the rebels control an area south of the park. Senior officials at the Ministry of Environmental Conservation and Forestry did not immediately reply to emailed queries about the planned national park. FFI has been working in Burma since 2006 and works with the Environment Ministry to carry out biodiversity surveys, develop species conservation programs and support the designation of new protected areas. It runs conservation projects Kachin State, Magwe, Irrawaddy and Tenasserim divisions and in the Imaw Bum area it has been implementing a community program to provide alternative livelihoods in order to end local hunting for food and traditional medicine.